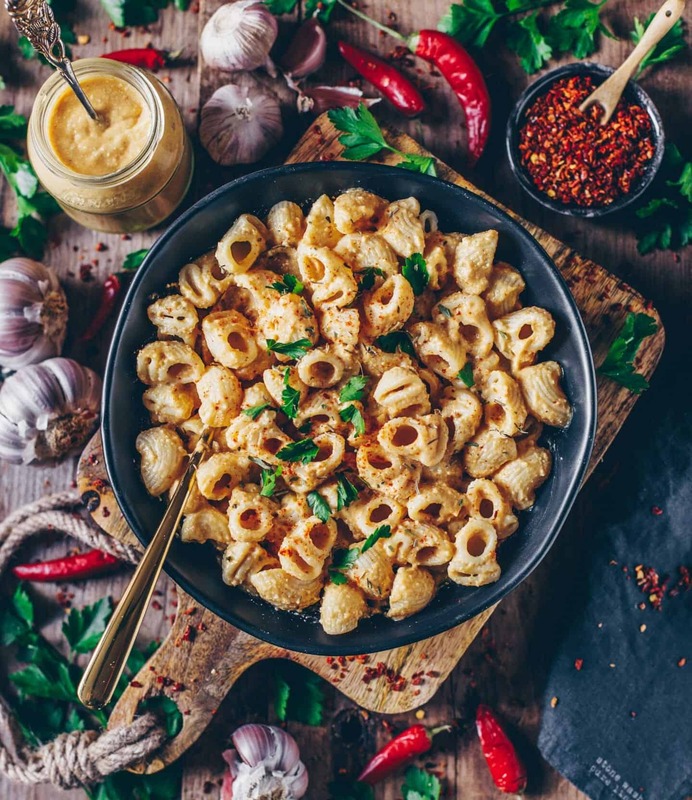 This Vegan Mac and Cheese is a healthy, delicious and creamy dairy-free, plant-based cheese sauce mainly based on potatoes. It’s super easy to make and also perfect to make a pasta bake! Today I‘d love to share one of my favorite recipes with you – namely Vegan Mac and Cheese! Honestly, who doesn‘t love pasta in combination with a creamy and delicious sauce? And yes, you’ve read right! 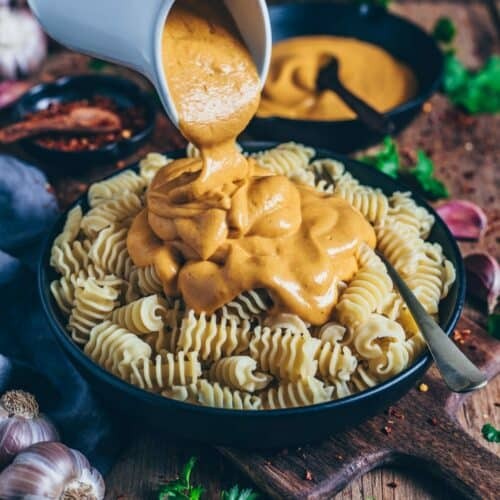 A vegan cheese sauce. Probably sounds contradictory, but with the right ingredients and perfect seasonings it’s possible. 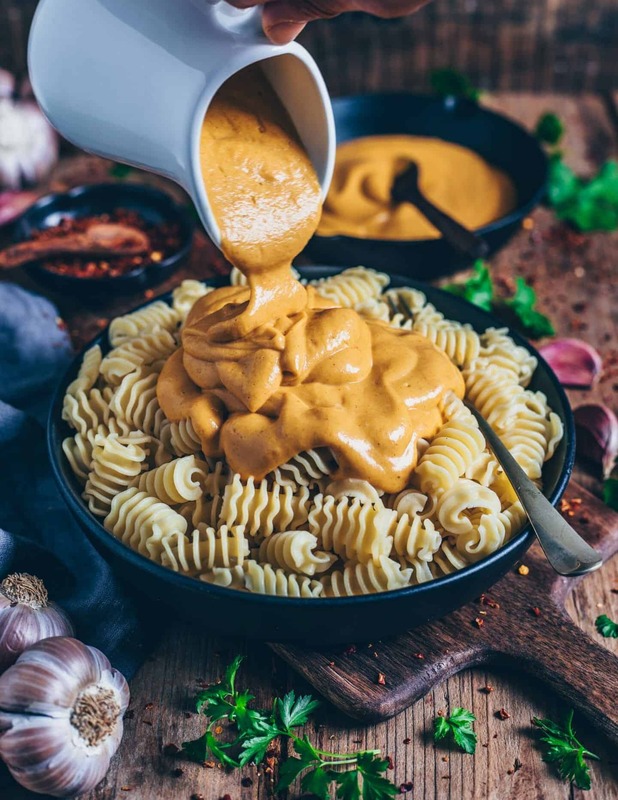 This healthy Vegan Mac and Cheese sauce is mainly based on potatoes, carrots, cashew nuts and a very special ingredient, that is – in my opinion – necessary for the taste – it‘s mustard! I’ve already tried the recipe without mustard but believe me, it’s not the same. For this recipe I used mustard in variety hot to refine, because I wanted it a bit more hot this time. But you can also use another type of mustard, of course. I personally always prefer products which contains neither preservatives n‘or additional flavours, because for me good ingredients and a perfect spice are very important. By the way, I have a special idea for you! When you buy mustard in jars, you do not only something good for the environment, but you can also reuse them for yourself or as a gift idea. I think to give away something unique or homemade is very special! Whether as decoration with a candle or as a jam jar for a homemade christmassy and sweet spread, as a selfmade snow globe, or as container for spices or even for your favorite cheese sauce (as I did). Such a mustard jar is so versatile. So, in my kitchen, a jar of mustard has always had a fixed place since already such a long time and should not be missed! If you like this recipe, you may also like my Vegan Alfredo Pasta Sauce made of Cashews. Soak Cashews for 4-6 hours (or better overnight). Then drain. (Optionally, you can also use bought cashew butter). Chop potatoes, carrots, onion and garlic and cook for about 10 minutes, or until the vegetables are soft enough to blend. In the meantime, cook pasta ‘al dente’ according to package instructions. Drain afterwards. 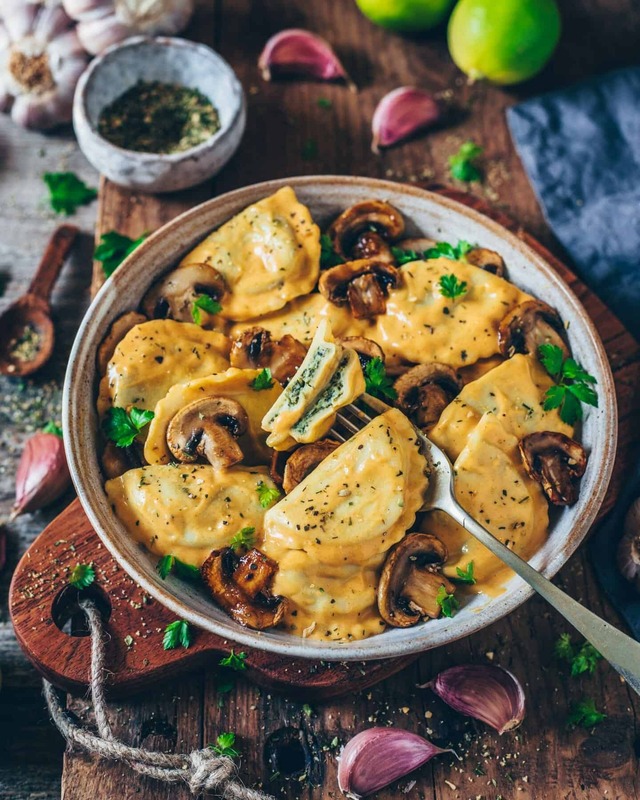 As soon as the vegetables are soft enough to blend, remove them with a slotted spoon from the cooking water and blend them with 175 ml of that cooking water along with the remaining ingredients in a blender for about 2 minutes until smooth and creamy. (The consistency of the sauce depends on the amount of the liquid). Pour the sauce over your cooked noodles. (Heat up again, if you like). Serve your mac and cheese with red pepper flakes and fresh parsley in a pasta dish. As option you can place the noodles in a baking dish, sprinkle with bread crumbs and bake at 180 degrees for about 15 minutes. Where do the following in ingredients get added? Yes, I published it in December 2017 ? These ingredients are for the sauce ? I have tried it out! And I’m so in love with this deliciously meal???? The sauce is so yummy and creamy. It’s so easy and fast to make. What I liked most of it that it feels so healthy and light. The steamed water vegetable is essential in the sauce. Thanks a lot for sharing, I’ve been trying so many vegan mac and cheese sauce and non where as good as your recipe. You made my day thanks a lot. It’s my new obsession Bianca! I tried it this week and I’m amazed at how quickly it’s made. It’s unbelievably delicious! Thank you so much! Is there a difference in using sweet potato instead of regular? Which do you recommend? I’m excited to make this! Of course, you could also use sweet potato. It’s super delicious as well! Schmeckt sehr, sehr geil – allerdings mir noch nicht cheesy genug. Werde aber auf der Grundlage weiter probieren. Als Dip bestimmt mega!!! Made this today! Such a delicious lunch choice😍 loved this easy recipe! In case anyone wonders, you boil the vegetables 😊 I wasn’t sure and steamed them which worked just as well. Love this recipe! Spicy but creamy and filling.